BILLFISH: Pretty slow numbers for billfish this week, but that is not to say that fishing is slow. There was a lot of activity but mostly on dorado. We had a glimmer of hope, that things were getting better at the end of this period, when Pisces La Brisa caught and released three marlin between 100 and 120 lbs at the Cerros de Arena on live caballito and landed a dorado, for French anglers Yves Jovitteau & Jean Claude Gerard. Pisces Valerie also had an outstanding catch this same day in front of the Old Lighthouse, when Rob Garza & Joshua Milton from Crow Point, Indiana, released a 120 lb striped marlin then went on to catch six dorado up to 25 lbs and a small wahoo. Tracy Ann always seems to be in the news and this week was no exception; on January 25th a group of Canadian anglers were on board fishing at the Cerro del Golden when they were fortunate to hook and successfully release two striped marlin up to 130 lbs and boat four dorado. Pisces top of the line 55ft Flora T II, had an excellent day for Javier & Mario Gonzalez from Austin, Texas who had fun fighting a 130 lb striped marlin that again took a live caballito and then went on to land three wahoo and a couple of dorado. So what’s going on with the marlin? It’s hard to say but the season seems to be messed up – warmer than normal, less bait and then when we spot them they don’t seem to be hungry. The water is a great color there is plenty of marine life; tons of bait in the bay which the sea lions are feasting on – we even saw a school of porpoise less than 500 yards off of the Hotel Hacienda – guess we have to patient. Pisces anglers caught a total of eleven striped marlin this week. 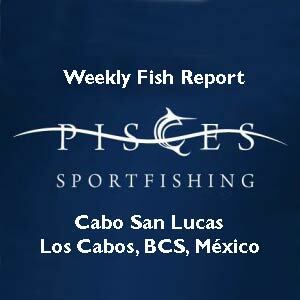 This entry was posted in cabo san lucas, Fish Reports, Pisces Sportfishing, sportfishing on February 3, 2015 by Roger.